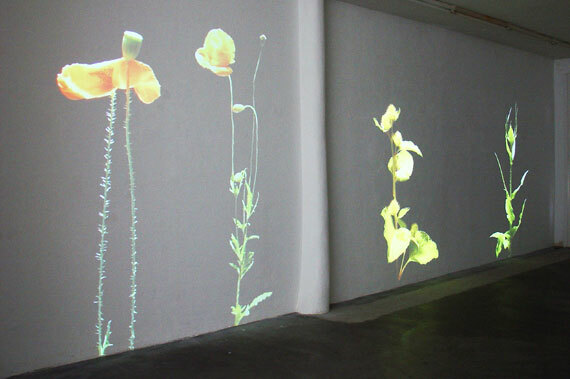 These video projections show a close up of a poppy and a thistle. At first sight, these plants are not moving, but after a while you see they are growing towards the light.They are inhabited by insects as the stern carries the weight of the bud. They are slightly moving, contemporary variations of a flower still-life that because of the Clair obscure light reminds us of 16th and 17th century painting. As in the traditional flower still life the symbolic meaning is obvious, (beauty, purity, mortality). The poppy is a very fragile flower that withers immediately after it’s picked. At the same time it is a pioneers plant with seeds able to germinate years later preferably in new soil.